It is in the enlightened self-interest of business to play a significant part in the fight against H.I.V./AIDS. Business needs a healthy, productive workforce to enhance operational efficiency. It also needs healthy, prosperous clients and customers. Although business was slow to react to H.I.V./AIDS, it has picked up the pace of its response. However, business can do more to fight AIDS. In this article, I discuss possible strategies for business to contribute most meaningfully to the fight against H.I.V./AIDS. The impact of AIDS on business has been devastating. According to a 2006 baseline survey of the AIDS response by business commissioned by the Global Business Coalition on H.I.V./AIDS, Tuberculosis, and Malaria, as well as reports by UNAIDs, the United Nations AIDS agency, and publications of the United Nations International Labor Organization, at least 37 million working people currently live with H.I.V. An average of 15 years of productive life will be lost by each worker living with H.I.V./AIDS. The size of the labor force may decrease between 5 and 35 percent in 32 African countries by 2020 as a result of AIDS. Without timely and continuous access to treatment, up to 74 million people will be lost to the labor force by 2015 due to AIDS. The economic impact could be equally devastating. By the beginning of the next decade, South Africa, Africa's economic powerhouse, may lose 17 percent of its gross domestic product principally due to AIDS. Four emerging markets that account for 8 percent of the global G.D.P. 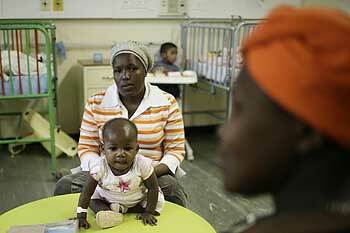 face serious challenges from AIDS. China, Russia, India, and Brazil face possible reduction of economic growth rates in the next decade as the incidence of H.I.V. and AIDS rises. For a global epidemic that targets men and women at the prime of their productive lives, it is not surprising that the business sector is now actively engaged in the fight against H.I.V./AIDS. Business is actively engaged in three strategies for AIDS relief, according to UNAIDS. First, business organizations, especially multinationals and large corporations, are actively engaged in workplace H.I.V. prevention and AIDS treatment programs. These programs often focus on active workers. In some instances, workplace programs extend to the immediate family members of workers and their dependents. Second, business organizations have formed coalitions at national, regional, and international levels in order to better understand the dynamics of H.I.V./AIDS and mobilize its members to join the fight. The Global Business Coalition and the South Africa Business Coalition on AIDS are among two of the best-known coalitions. According to a World Economic Forum and World Bank study released in November 2006, the number of business coalitions in sub-Sahara Africa had reached nearly 2,000. These business coalitions often participate in policy debates at national and international levels, host fundraisers, and utilize their high-profile chief executives to make the case for significant increases in funding for H.I.V./AIDS programs. Third, business donates products and services, including volunteer services. These donations include "strategic" giving, corporate philanthropy, public/private partnerships, and individual volunteering efforts of staff. It is widely believed that the organized business sector is not yet a significant factor in the global resource mobilization against AIDS. This is likely to change as more businesses come on board in the fight against AIDS and as the sector continues its leadership role as a focal point in the operations of the Global Fund to Fight AIDS, Tuberculosis, and Malaria. What Should Business Do in the Fight Against AIDS? There are four critical issues looming in the fight against AIDS in the next decade. First is the need for stable funding. UNAIDS estimates that only half of the required funding is being mobilized for AIDS relief. Second is the need to integrate prevention, treatment, and support services. Third is the imperative to move the fight against AIDS to communities where individuals living with AIDS live and die. Fourth is the importance of accelerating research on H.I.V./AIDS, with a major focus on developing and deploying effective H.I.V. vaccines. Business can play an immediate and sustained role on issues of stable funding and the creation and maintenance of community-based responses to AIDS. Currently, bilateral and multilateral agencies are actively engaged in organized efforts to integrate preventive, treatment, and supportive care. The Global Fund, the Bush administration's President's Emergency Plan for AIDS Relief (PEPFAR) program, the World Bank AIDS program and the European Union AIDS program are important ongoing bilateral and multilateral efforts to link prevention, treatment, and social support services. However, pharmaceutical companies remain critical to global efforts to reduce the cost of antiretroviral medicines and develop newer and more effective lifesaving medicines. Foundations and philanthropies are bankrolling alliances dedicated to the discovery and deployment of an H.I.V. vaccine. The biggest impact business can have regarding stable funding in the fight against AIDS is to focus on closing resource gaps in poor communities around the world. H.I.V./AIDS remedial efforts remain weakest around the world at community levels. The key is to show global concern for H.I.V./AIDS but act locally to close resource mobilization gaps. Business should focus on closing funding gaps for community-based programs working to achieve the United Nations-mandated universal access to H.I.V./AIDS, TB, and malaria services. The mandate is to achieve universal access on or before 2010. H.I.V./AIDS, TB, and malaria have a profound negative impact on the standard of living in resource-challenged environments around the world, especially in Africa. Organized efforts to achieve universal access to H.I.V./AIDS, TB, and malaria services at community levels will have an immediate positive impact on local health systems as upgrades become inevitable. Organized efforts to achieve universal access would also positively impact the local health workforce as re-training of current staff and hiring of new skilled workers become necessary. In addition, an integrated H.I.V./AIDS, TB, and malaria initiative program will accelerate unavoidable upgrades in laboratory services to improve the quality of diagnostic tests. Better diagnostic services will also necessitate improvements in the standard of health facilities. Businesses should start with closing funding gaps in their areas of operations. This effort can subsequently expand to other communities and neighborhoods. The ultimate goal is for multinational companies, conglomerates, and other business entities in resource-challenged environments around the world to finance within a short period of time the scale up of viable community-based H.I.V/AIDS, TB, and malaria programs. The simplest strategy to close funding gaps in local communities is for businesses to expand their workplace H.I.V./AIDS, TB, and malaria programs beyond their workers and immediate family members to local communities. This strategy will burnish the community outreach credentials of a business and boost staff morale as relatives and friends benefit from their employer's outreach services. Imagine the transformation H.I.V./AIDS, TB, and malaria remedial efforts in Southern Africa would undergo if all the mining and electricity conglomerates came together and decided collectively to close all funding gaps for viable community-based programs throughout the region. Business can dramatically improve community-based responses to AIDS by focusing on their comparative operational advantages. While it is the responsibility of governments to build basic infrastructure, business can focus on three areas in which most governments in resource-challenged environments have not been very successful. Businesses can help rebuild basic health clinics and primary health care centers in their areas of operations. These health facilities are the first lines of defense in any effective health system. Unfortunately, they are weakest in most poor countries that have a high H.I.V. prevalence. These revamped primary health facilities will then become part of a functional and effective local health system. Business can also help improve the logistics of healthcare delivery by directly easing transportation difficulties for families who live far away from health facilities or by supporting local organizations with the expertise to provide such services; by financing micro-credit services to spur entrepreneurship and generate wealth at community levels; by supporting the education of AIDS orphans, including financing incentives for poor families to keep their children in school; by providing regular modest financial support for grandparents and other relatives that are raising AIDS orphans; and by supporting the recruitment and deployment of health personnel, including outreach health workers in community-based health systems. In a recent book on AIDS orphans and their grandparents, a colleague and I indicated that as little as a $20 regular stipend a month could go a long way in allowing poor grandparents in East Africa to provide support to AIDS orphans under their care. The key to getting business involved in community-based AIDS responses is to avoid letting it become the "local government" or local overseer of the AIDS response. Business is unlikely to do what governments must provide for their people. However, business can become a better, smarter partner by focusing on closing verifiable funding gaps at community levels. Business should close funding gaps for viable programs and work with affected communities to sustain these programs for the long term. Where these programs do not exist, business can help establish local public-private coalitions to provide such services. By burnishing its community credentials through verifiable support of community-focused health programs, business can meet one of its cherished goals: becoming effective advocates for change in policymaking circles through unquestionable commitment to better health at community levels. The fight against H.I.V./AIDS will move increasingly to local communities. Business has an excellent opportunity to become a significant partner as at-risk communities become the last frontiers in the battle against H.I.V./AIDS.